Hans Osthoff and his team are studying the influence of sea salt aerosol-derived chlorine on NOx and ozone in the Lower Fraser Valley, with funding from BC CLEAR. See the overview and visit the Osthoff Lab website for more detail. Researchers will focus on quantifying the nocturnal conversion of NOx to N2O5 and ClNO2 in the Lower Fraser Valley (LFV). This chemistry is currently not constrained by measurements, yet is potentially significant since all precursors (aerosol chloride, NOx, and O3) are abundant. 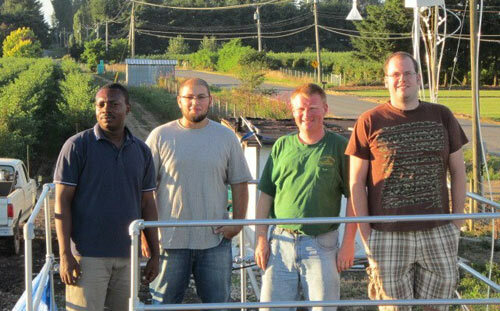 The research team will quantify the mixing ratios of NOx, O3, N2O5, ClNO2 and other relevant species at a ground station at the Abbotsford airport during a two-week period in summer (the peak of O3 season) 2012. These measurements will be used to determine the importance of the nocturnal recycling of NOx via the N2O5 / ClNO2 pathway compared to the competing reactions of NO3 and N2O5 at this site. This knowledge is relevant for management of ozone (O3) as it will allow a more accurate description of NOx and odd oxygen (=O3+NO2) chemistry in models and will help guide air quality policy decisions. Efficient formation of ClNO2 in ambient air can have considerable influence on O3 production, especially during stagnation periods, as NOx and Ox formed during the preceding days are regenerated rather than being removed from the atmosphere. Aerosol chloride is needed to recycle NOx via ClNO2 but is naturally present in the LFV (due to proximity to the oceans) and cannot be regulated. Thus, if this chemistry is found to be efficient, tighter regulation of NOx emissions may be required, in particular during stagnation periods. Researchers will determine the potential air quality and health benefits of replacing old, inefficient wood-burning stoves with newer, efficient and cleaner burning ones. The study will provide real-life experience for Lil’wat university students in air quality monitoring through the environmental monitoring program at the Ts’zil Learning Centre. The research will determine the impact of a pilot woodstove replacement and communication outreach program on community understanding, receptiveness and interest in wood-stove upgrades, wood seasoning and appropriate wood-burning techniques. On a larger scale, the study will determine the economic opportunity for developing a community-based bioenergy supply operation in the Lil’wat community. The study will determine the technical and economic feasibility of using a solar wall renewable energy source on commercial buildings in the interior of BC to decrease fossil fuel consumption. Healthcare facilities constitute the largest commercial building sector in BC. All air used for hospital ventilation needs to be 100% outside air and must be heated to 25 degrees Celcius, a process that uses fossil fuels such as natural gas, propane or fuel oil. The heated, conditioned air is then 100% exhausted to atmosphere. If solar walls are found to be feasible, they could be used to preheat hospital air with a renewable energy source. 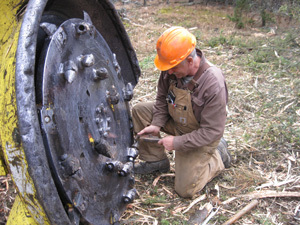 Don Cook (photo left) changes a tooth on a rotary mulching head during a project that tested mastication as a means of reducing GHGs and particulate emissions. Airsheds are under increasing pressure to meet air quality standards across BC, and the Rocky Mountain Trench region is an airshed in which there are challenges meeting air quality targets. The study will contribute to air quality management by testing whether mastication (a mechanical means of small-diameter tree removal whereby the wood is chopped into a woody mulch ground cover) can reduce GHGs and particulate emissions at a lower cost than the predominant ecosystem restoration (ER) methods (mechanical and hand slashing removal of small diameter trees along with open burning). Currently, mechanical and hand slashing removal of small diameter trees along with follow-up piling (either by hand or mechanical means) and follow-up open burning are the standard ER practices used across BC. The project will estimate the emissions produced by mastication treatments versus traditional ER methods and thereby determine the net emissions reduction potential for increasing the use of mastication as a prescribed tool for ER treatments. The project team will determine the market and non-market net benefits of using mastication through a cost-benefit analysis, and the results from this project will help support best forest management practices. Helping local governments understand the potential for electric vehicles to improve air quality in their communities is the objective of this study. The Pembina Institute will quantify the potential reductions in air emissions, including greenhouse gases, and share stories of everyday driving. Researchers will document stories of electric vehicles adoption in BC communities through interviews with owners of electric vehicles. A video will be produced as a resource for local governments that are considering support for electric vehicle adoption as part of their own clean air actions. Researchers will also estimate and model air quality impacts of electric vehicle adoption for three BC communities. If the research demonstrates that air quality benefits are significant, it will help motivate local governments to encourage electric vehicle adoption in their communities.